After 16 years at the Holiday Inn Marina, Abyss Dive Center has moved to a new location at Bonefish Bay in Marathon! Bonefish Bay is located at mile marker 53.5, only one block south of Holiday Inn. Now offering two types of lodging/dive packages with Holiday Inn and Bonefish Bay Cottages, divers are easily accommodated according to individual preferences and expectations. Enjoy daily reef trips, night or wreck dives with the dive boat, Vitamin Sea, located right on property! A full service dive center, Abyss offers rental equipment as well as a complete inventory for the diver or snorkeler featuring Scubapro and Mares equipment. Instruction is offered from the Discover Scuba Resort Course to the esteemed Divemaster Certification and is most convenient with a pool right next to the dive center! Experience the space on board our custom designed, 34 foot Crusader. We carry a maximum of six passengers to assure your comfort, provide the ultimate in safety and guarantee maximum personal attention to your needs! The Vitamin Sea is equipped with a fresh water shower, a toilet facility, a dedicated camera rinse tank, complimentary sodas and ice water. There is a large cooler on board to keep any food or personal snacks cold as well.There are over 50 locations to choose from in this barrier reef of Marathon. 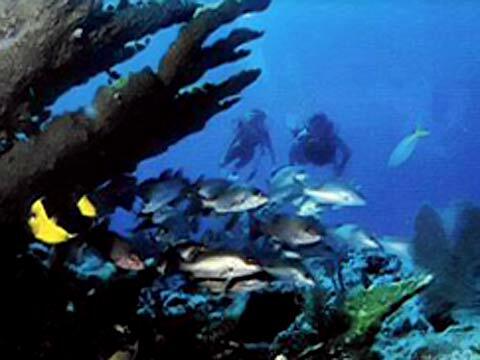 They include large quantities and varieties of marine life and living coral reef. Colorful, shallow reefs are abundant and include Yellow Rocks, Sombrero Reef, or Delta Shoals, favorites with divers and fish! Mid to deep reef sites like The Gap, Sombrero Ledge or the Shrimp Boat Reef are rich with sea life and corals in depths ranging from 50 to 80 feet. For experienced divers there is the world class shipwreck THUNDERBOLT, a World War II cable layer and research vessel. She lies upright in 120 feet of water and hosts a teeming community of sea life. Shallow wrecks like The Barge and The Adelaide Baker provide interesting coral growths and a bit of history to boot! The charm of the islands of Marathon and a world of underwater adventure make the heart of the Florida Keys a true wonder to be seen and an experience you'll never forget. Instruction is available from the introductory Resort Course thru Divemaster training. With the convenience of a fresh water pool right next to the dive center for confined water training and the warm, clear water off shore for open water check â€“ out dives, Bonefish Bay provides a perfect setting to begin or expand your scuba education! Abyss Dive Center has a fine staff of PADI and SSI instructors to offer all agency open water referral check out dives or assist your desire to further your education in scuba with the agency you started with. See a complete list of prices for instruction at the end of the website.The Florida Keys are home to the only living barrier coral reef in North America and Marathon is a scuba diver's or snorkelerâ€™ s paradise! Located right in the middle of the Florida Keys, Marathon is known as "the heart of the Florida Keys". From the 7 mile Bridge to Crane Point Hammock, from Dolphin Research Center to Historic Pigeon Key, Marathon is filled with diversity! Henry Flagler's "marathon" effort to build his railroad gave the island its name. It's where friendly people will make you feel welcome and say "We're glad you're here. Enjoy the convenient, same location dive center and dive boat from your Bonefish Bay cottage or nearby Holiday Inn room! All Dive/Accommodation package guests receive priority treatment with a late check out after morning trips and gear stowage at the dive center between dive trips. Packages are booked in one easy step thru the dive center. Bonefish Bay has a 2 night minimum stay, Holiday Inn has no minimum stay requirements.